UFC light heavyweight Khalil Rountree has been a tough nut to crack during his run inside the Octagon. It's been very difficult to predict how his fights will go, as he often wins the fights he's supposed to lose and lose the fights he's supposed to win. 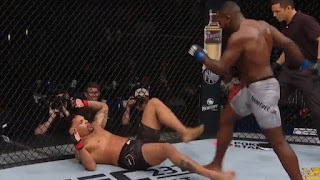 That was once again the case at UFC 236, where he took on Eryk Anders in a main card bout. The betting odds had Rountree as the underdog, and coming off of a brutal knockout loss to Johnny Walker it made sense, as many were off the Rountree bandwagon. But once again Rountree showed why he was such a highly-touted in the first place, as he beat and battered Anders en route to a unanimous decision win. It was a breakthrough performance for the former TUF contestant, whose MMA record now stands at 8-3, 1 NC, with a 4-3, 1 NC mark in the Octagon. We have seen Rountree show flashes of brilliance in the past. His KO win over Gokhan Saki at UFC 226 was by far the signature moment of his career up to this fight against Anders, and we also saw him finish Daniel Jolly and Paul Craig prior to that. Losses to Walker, Andrew Craig and Tyson Pedro showed that Rountree has many holes in his game, but against Anders he showed that he has worked really hard to tighten up those weak spots in his game. The fight against Anders was the most complete version of Rountree we've ever seen inside the Octagon. As the commentary booth mentioned during the fight, Rountree moved to Thailand for this training camp to clean up his striking technique. His standup was already the best part of his game, but the training he did in Thailand took things to another level. Right away, Rountree came out with a traditional Thai stance and started to kick the legs of Anders, weakening his base. Rountree continued to chop down Anders with low kicks and take the first round clearly 10-9. The second round is where Rountree really showed off. In one of the most one-sided rounds in UFC history, Rountree knocked down Anders four times with punches. It's amazing that Anders was able to stay in the fight and make it until the final bell because the second round was pure brutality. Rountree showed off an incredible striking attack in this round, and it looks like this could be a turning point in his career. It appears he's taken the next step as an MMA fighter, and after this eye-opening performance against Anders you have to talk about Rountree as a dark horse contender at 205 lbs. Just 29, Rountree is in his prime, and with a winning record in the Octagon he deserves a step up in competition. For his next fight, the UFC should consider matching Rountree up with Nikita Krylov, who finished Ovince Saint-Preux earlier on the main card via rear naked choke. Both Rountree and Krylov are impressive young fighters in a division full of older veterans, and pairing them up would help determine who is ready to take the next step in his MMA career. Plus, we need to see more of Rountree's ground game before we really anoint him a future contender at light heavyweight. 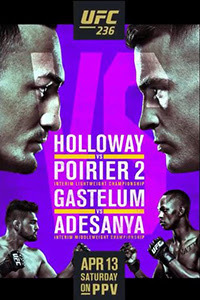 UFC 236 is going to be remembered for the two amazing fights at the top of the bill in Dustin Poirier vs. Max Holloway and Israel Adesanya vs. Kelvin Gastelum, but Rountree's epic beatdown against Anders shouldn't be forgotten. 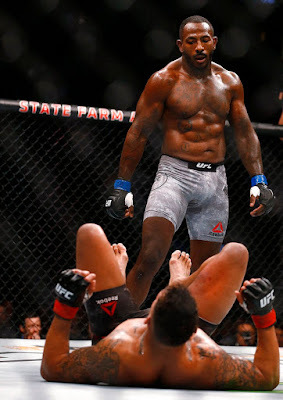 Though he's been inconsistent in the UFC thus far, this could be the fight Rountree needed to really take the next step in his career, and after seeing all the improvements in his game, his next fight is going to be very highly anticipated.